One Thousand and One Nights, also known as the Arabian Nights, is a collection of Middle Eastern and South Asian stories compiled during the Islamic Golden Age. The beautiful Sheherazade, threatened with death, manages to postpone the fatal day by telling one marvellous story every night. The stories themselves are folk tales, fairy tales and poems collected over many centuries, from ancient and medieval Arabic, Persian, Mesopotamian, Indian, and Egyptian folklore and literature. This makes The Arabian Nights a priceless treasure, as it takes us to the very roots of our culture in a delightful and passionate way. 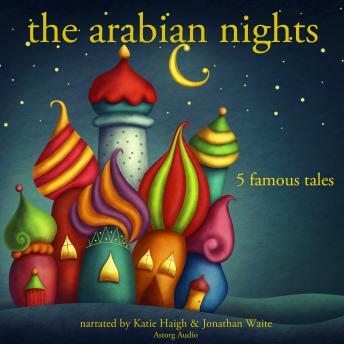 We have selected for you 5 of the most charming stories told by Sheherazade: Persevere and Prosper; The Story of Caliph Stork; The Enchanted Horse; Ali Baba and the Forty Thieves; and Sinbad the Sailor.